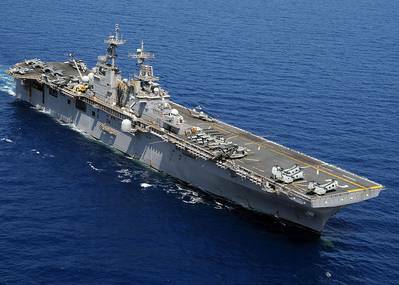 The Navy's amphibious assault ship 'USS Essex' is dry docked at General Dynamics NASSCO for at least $150 million in repairs and upgrades. USS Essex, which displaces more than 40,000 tons when loaded for combat, is the biggest Navy ship that can fit into dry dock at NASSCO, the last major shipbuilder on the West Coast, reports U-T San Diego. The money for the ship's overhaul was appropriated before sequestration kicked in, so the work is expected to go forth without interruption. The Essex project involves hundreds of employees from NASSCO as well as BAE Systems and Continental Maritime, shipyards who often collaborate on major undertakings. The warship is scheduled to be in dry dock for about six months.